Two organically certified March 2009 handharvested Silver Needle tea (Baihao Yinzhen) from China's Fujian province. People rave about the fresh taste and health benefits of a Silver Needle white tea. But do you know that most white teas sold in the West have been blended using the lower grades? They are good, but the real thing is a lot better. This high grade Silver Needle tea comes from Fuding county. It has been handharvested and withered using the century-old sunshine/indoor withering method. I first tasted it during the 2009 spring season. I have to confess - I was absolutely overwhelmed by its sweet taste, grape-like aroma and shining yellow liquor, which being so thick and viscous - is such a delight to admire at. 3 grams will yield three 8-ounce (250 grams) infusions. Of which, the second infusion is the best. Brewing close to boiling point water is recommended. This grade was first launched in 2008 and has been discontinued and replaced by the above AAA grade in 2009. The A grade is the blended version of the AAA grade. Her aroma is less overpowering, and the taste is sweet and more haylike. I tend to drink this A grade when I am in need for a quick, refreshing white tea, but doesn't have the time to admire the beautiful liquor and intoxicating aroma of her AAA grade sister. 3 grams each time will yield three satisfactory infusions. My customer Sigurd reviewed this tea and recommended a higher price tag. Silver Needle Tea - My $34 Versus Julian's $10 Discovery? The Baihao Yinzheng AA is a very pleasant tea, starting with a slightly hay-like fragrance ringed by a hint of mint, followed up by a mild taste of blended spices, maybe cinnamon and cardamom, before ending in a discrete herbal acidity. It is "tea-like" in the Western style than the other high quality teas offered by you. - I wish for a Wang [King] grade some day!. In the second infusion I do not find the mild spices, only herbal notes and the palate-refreshing acidity. Just wanted to let you know that we got the tea. Thank you it's very good. I have not had a lot of experience with white tea having had only one other type. I would think that I would rate it a 4 as it brews multiple batches nicely with a sweet aroma and good flavor. Feel free to publish my feed back. The tea is excellent, thanks!! I'm relatively inexperienced with regards to tea, so it doesn't necessarily take a lot to impress me, but I was definitely impressed. Very tasty stuff! I enjoy it pretty much daily. I am very much enjoying the Bai Hao. Quite possibly the best Silver Needle I have ever had. 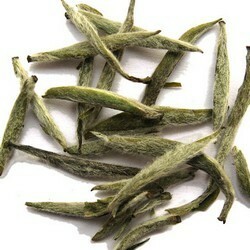 And I am not a huge fan of white tea, so it is a treat to find such an enjoyable one. I really enjoy it. Great all around flavor, not too "funky" as I find some white teas to be. Mild notes of hay, almost buttery. I am not sure what my input is worth (I don't drink many white teas) but I'd give this one a 5. My first rating is for the Yinzhen Silver Needle is a 4 out of 5. Its the best Silver Needle I ever had, and the price is really good for this quality. Don't know yet if I would find a better Yinzhen, if not I would give this is a 5! The Baihao Yinzhen you sent me is great. Am enjoying it very much, and would definitely give it a 5. I appreciated the well sealed packaging it was sent in, getting it here in a good fresh condition. Yes, I really like the Silver Needle. 4.5 out of 5! I reach for this tea when I'm feeling delicate or simply tired and need soothing. There is a light but clear fruitiness about it though stronger for me is the wet-hay aroma that clears my head and brings memories too.